HUMUS Cover Scent 8 oz. Ghost Hair & Body Soap 12 fl. oz. 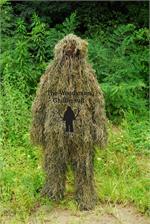 Ghost clothes Wash 12 fl. oz. FRP-103 Dry Fire-retardant (1 lb. bag).. Body Lotion Unscented 8 fl. oz. Ghost Hair Conditioner Unscented 8 fl. oz. DeeR Nip Curiosity Attractant 8 fl. oz. 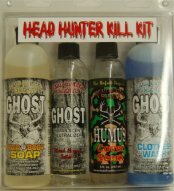 Head Hunter Scents - Ghost Package. UV Killer clothing Spray 18 fl. oz.